The Government of India has approved the Trafficking of Persons (Prevention, Protection and Rehabilitation) Bill, 2018 which will be introduced in the Parliament. It would be introduced in the Parliament in the second half of the Budget Session commencing from 5th March 2018. It was prepared in consultation with various Ministries, State Governments, Departments, and NGOs etc. Consultations from the Ministry of Women and Child Development have also been incorporated in the Bill. Human trafficking is one of the major problems in India. It is the third largest organized crime which violates the basic human rights. As far as now, there is no specific law to deal with this crime related to human trafficking. 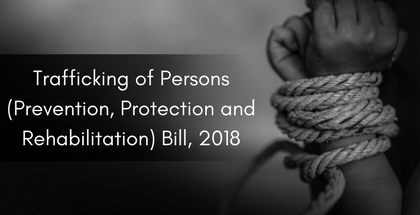 The Trafficking of Persons (Prevention, Protection and Rehabilitation) Bill, 2018 addresses human trafficking which is one of the most rampant yet less noticeable crime in India. The biggest issue is that there is a lack of knowledge about it. Human trafficking involves trade of people especially children and women. It is one of the fastest growing crimes in the developing countries. The two major causes which lead to trafficking of people in India includes bonded labour and child marriages. In India, a combination of penal, labour and contract laws are used to impose obligations in order to ensure better working conditions. The Bill provides for a rehabilitation fund for the victims of human trafficking and setting up of designated courts in every district to ensure a quick and time-bound trials of the criminals. It aims to make India a leader among South Asian countries so as to combat human trafficking. It ensures to address this problem of trafficking of people from a point of view that would support prevention of the crime, immediate protection of the rescued victims and rehabilitating the victims affected. A rehabilitation fund would be created for the victims to ensure their physical, social and psychological well-being. It would provide them with education, health care, skill development, financial and legal aid, safe and secure accommodation etc. The victims would be entitled to interim relief immediately within 30 days and an appropriate relief further within 60 days from the date of filing the charge sheet. Apart from this, designating courts in each and every district to ensure time-bound and speed trial of the victims within a period of one year from taking into cognizance. The Bill includes aggravated forms of trafficking which involves trafficking for the purpose of begging, forcing those who are mentally ill or pregnant women, trafficking of women or children for the purpose of marriage etc. It ensures punishment for those promoting or facilitating trafficking of people. It includes printing, producing, issuing, distributing of fake or unauthorized certificates as proof of compliance with the Government. It prescribes punishment of minimum 10 years and a fine not less than Rs 1 lakh. The bill ensures maintaining the confidentiality of the victims and the witnesses by not disclosing their identity. This would help to mitigate trans-border and inter-State crimes. The confidentiality would be maintained by recording their statement through video conferencing. It would create a dedicated institutional mechanism at the District, State and Central level. These would be responsible for protecting the victims, preventing the crime, rehabilitating the victims etc. The tasks of the Anti-Trafficking Bureau will be performed by the National Investigating Agency (NIA) at the national level. The Bill addresses the transnational nature of the crime. It entrusts the National Anti-Trafficking Bureau (NATB) to perform functions related to international coordination with the foreign authorities and international organizations. Apart from this, it would also facilitate inter-state and trans-border transfer of evidences or witnesses as well as facilitate inter-state and international video-conferencing in judicial proceedings.